Gift Baskets, Nuts, Candy, Cookies, Brownies and more! Did you know that promotional gifts for the Kitchen are kept a long time? 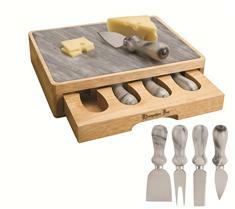 A smart way to keep your brand in front of your customers as shown with our 5 piece Marble top Cheese set. The marble cutting surface has a hidden wooden drawer for storing knives. The steel knives have matching marble handles for a coordinated look. The set includes a wide spreader, knife/spreader combo, knife, fork for all of your cheese cutting needs. Show your appreciation and reward your best Customers and Employees with this gift. Imprint Area: 2-1/4" x 3/8"